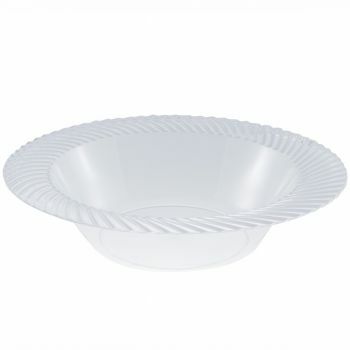 Product: 170ml/6oz Clear Disposable Plastic Bowls with Swirl Design – Pack of 10 was added to cart. Serve up starters, desserts and snacks in style with Mashers Clear Plastic Disposable Bowls. Part of the hugely popular Swirl Collection, these premium quality 6oz dessert bowls are made from ultra-strong plastic, finished in Clear to complement all table settings, and elegantly decorated with swirl detailing for a modern designer look. Washable and reusable, they are a great investment for weddings, birthday celebrations, and impromptu dinner parties. Coordinating disposable dinner plates and side plates available in the Mashers Collection.